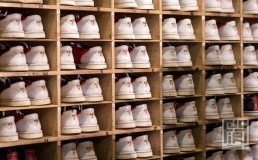 All Star Lanes, Brick Lane is the flagship venue for this established boutique bowling company. 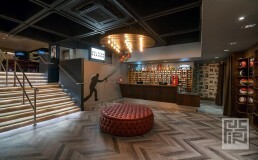 The company’s establishment in 2006 brought new thinking to this sector; bowling whilst enjoying food, drink and most of all quality interiors. Incorporating a slick new cocktail lounge and private lanes with a speakeasy décor inspired by the Brooklyn skyline to give a stylish private hire opportunity for the site. Our key focus was to ensure we developed a bespoke interior scheme taking inspiration and direction from the mid-century American heritage that surrounds the brand’s cornerstones. The look and feel is soft, eclectic and inviting, encouraging the customer to use this fantastic corner of the old Truman Brewery not just for bowling, but for a variety of social occasions. It was important we made the space accessible and desirable for a range of users. We wanted to ensure we delivered a platform and environment to showcase the ‘All Star’ experience in the best possible way. Major milestones included the development of the external roof terrace concept to the private lanes. This needed to be carefully executed to give the feeling you were stepping out of the Brooklyn penthouse and out onto an urban roof, whilst all the time, still being inside. Iconic furniture pieces with vintage fabrics were key to providing a luxurious mid-century style throughout the venue inspired by the 50’s ‘Mad Men’ era. With a backdrop of exposed brick and industrial pendant light fittings linking to the urban location of the Brick Lane site. Opulent velvets with rich deep jewel colours hidden away in the speakeasy private bar creates a luxurious space for functions. A large feature wall graphic emulating the Brooklyn skyline comes to life with a balcony detail emulating the New York urban rooftops. 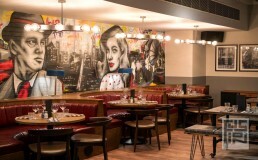 The design incorporates cues from the local community, including two bespoke murals from acclaimed East London-based street artist Zabou. Known for her bold and thought-provoking pieces across London.